These abrasive cleaning brushes are all metal construction, adjustable length, refillable cleaning tools. The exposed brush length is adjustable by the turning of a knob. The overall length of the tool is 3-3/4" and the cleaning tip is approximately 3/16" in diameter. 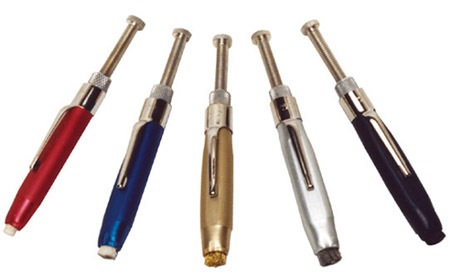 The brushes are available in four different materials: Fiberglass (Fine and Coarse), Stainless Steel, Brass, and Nylon. All of the refills can be interchanged into any of the brush bodies.